This is a beautiful, quiet, relaxing ocean front community. This 2 bedroom/1 bathroom condo, located in The Diplomat Condominium Complex. It is about 1/2 mile South of the World Famous Ron Jon Surf Shop, one of the best locations in Cocoa Beach. We are within walking distance of so many great restaurants, beach bars, etc. The condo is a second floor end unit. 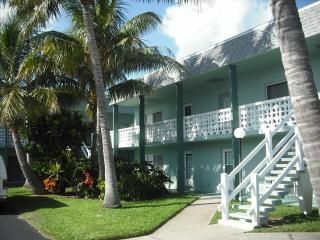 The beachfront condo complex has it's own gated boardwalk to the ocean (see photo above - the condo is only a few steps away from the boardwalk), a community recreation center, shuffleboard and tennis courts, laundry facilities, and a heated pool for the winter months with a club house (see photo above). The community has just completed a covered picnic area with an outdoor charcoal BBQ. We also have a great view of any rocket launches from the beach. The Diplomat Condominium Complex is located beach side just off of A1A, directly across the street and within easy walking distance to a grocery store (Publix, across the street), restaurants, bars, state parks and shopping. There is no need to drive once you arrive at the condo. It is minutes from local attractions and the Kennedy Space Center. Easy access and about 30 minutes away from Disney, Sea World and Universal. It's time to start planning that spring/summer vacation. We have great bi-weekly rates as low as $799.00 for two weeks. I always keep our calendar up to date, so if you see an open week, please email me. I can't wait to set up your relaxing beach vacation! Thank you! **Our long term winter tenants (10 + years) have decided not to renew next winter. I've opened up the dates and we are looking for a minimum of January- March winter rental. Please email me if interested for special pricing. I am a true Floridaian, born and raised. I purchased this condo in 2002 as an escape from the chaos of Orlando. We decided to rent it and share our relaxing get-away with our VRBO friends. It is such a treat to feel the ocean breeze, smell the ocean air and be away from it all on vacation. No worries...We hope you feel the same way after staying at the Diplomat. The location is perfect. The semi-private beach access is just a few steps away from your front door. The gated beach entry is for Diplomat guests only. After soaking up the sun, its always nice to take a refreshing dip in the pool! The condo is located within walking distance of a grocery store, restaurants, cold drinks, live music, tiki bar, and parks. Our unit is in the middle of the beachfront complex. We are located just a few steps away from the beach to the east and the community pool to the west. Google Earth the property for an overview of The Diplomat Complex and Cocoa Beach landmarks. 3150 N. Atlantic Avenue, Cocoa Beach FL 32931. The property is safe, secure and well maintained. The Diplomat is one of the nicest condominium complexes in Cocoa Beach. Our beach is a great spot to check out the SpaceX rocket launches! We are steps from the ocean. The Diplomat Condo complex sits beachside with full amenities. Heated pool, Tennis courts, Laundry facility, shuffle board, BBQ. Our condo sits beach side on A1A. Although our condo is not direct oceanfront, its just a short walk down to the beach. The Diplomat Condo complex sits beach side. The Diplomat Condos are located in an Oceanfront community. Linens are provided for both queen beds with a spare set for each. Washer included inside the condo. Additional laundry facility located on Diplomat property. Dryer included inside the condo. Additional laundry facility located on Diplomat property. Parking onsite is allowed for Diplomat owners and guests only. Parking Pass required. This is obtained at the clubhouse. Both Beach and Bath towels are provided. TV mounted on wall, sofa and buffet table. Keurig and Regular Coffee Pot. All Dishes, utensils, glasses, and cooking ware provided. Our kitchen includes all dishes, plates, utensils, pots/pans, coffee mugs, wine glasses, etc. you would need to feel at home. Beach toys, umbrella, body boards, beach chairs. We are the end unit. Therefore, we have a private area at the end of the hallway. We have a gated, heated pool onsite for Diplomat guests. Thank you for your kind words. I’m so happy you enjoyed your stay. You’re welcome back anytime! We loved being so close to the beach. It was very nice. A little out dated but fit our needs and we loved being so close to the beach. Super cute condo! Very convenient. We love visiting Cocoa Beach and this trip was super great thanks to staying in this condo. Very well stocked and comfortable. The owner, Liz, is very nice. You can’t beat the one minute walk to the beach! A great stay at Cocoa Beach! Our stay at the Diplomat was very enjoyable! We enjoyed playing shuffleboard, swimming in the pool and spending time at the beach (only minutes from our front door). The condo had everything we needed for a day at the beach to include beach chairs, umbrella, boogie boards, and coolers. The kitchen is equipped with everything you would need to prepare meals, also a blender and coffeemaker as well as a Keurig. The bedrooms were tastefully decorated in beach motif and the beds were very comfortable! Thank you Liz for an enjoyable and relaxing time in the Florida sun! We hope to visit again someday! We rented the appartment for 1 month during the hurricaine Irma. We where not allowed to stay in the area for four days, and when we came back from our hotel stay in Orlando, we had big problems to find a place to stay. We had no help from the owner! There was no water and no electricity. No hotells where open in Cocoa, even though our owner of the appartment told us so. We stayed in the appartment for two days with no electricity before one hotel opened in Cocoa. We had to pay for another two nights! On day nine the electricity came back, but even though we told the owner that the television did not work she did not do anything about it. Refound for the days we where not able to stay in the appartment we nerver received! No compensation for not working television! What we have here is a owner who just care for the money and not for the persons who rents the appartment. We where a long way from home in a foreign country, scared with no help! We are from Sweden. I, once again, apologize for the inconvenience Hurricane Irma caused you and your family during your stay in August. This was an unprecedented Category 5 storm impacting millions of Floridians, causing $100 Billion dollars in property loss and damage. I understand this situation can be very scary and it was unfortunate the storm made landfall during your vacation. I’m grateful the impact had only minor damage to the condo complex and you and your family are safe. Brevard County issued a mandatory evacuation for your safety. Due to the condo complex being direct oceanfront, and uncertainty of the storm path, it is always best to evacuate inland. It was not a matter of “not being allowed to stay” as stated in your review, it was a requirement for your safety. The power and cable were out of operation for several days, 16 million Floridians were also out of power, it was not isolated only on Cooca Beach. This was clearly out of my control, and I wish it hadn’t impacted you. What I could control was continuing to call Duke Energy, the condo association and keeping you updated daily/hourly via email and phone, which I did. Regarding the TV, Bright house was not accepting status calls as almost 100% of its customers were impacted by Irma. They were well aware of the wide spread issues and were diligently working to completely restore operations. They were working to restore service around the clock, with technicians from across the country helping the entire State of Florida. For future tenants reading this review, it is always recommended to obtain travel insurance if traveling to an area which could be impacted during hurricane season. It is not customary to receive reimbursement for weather related disturbances, and this language is included all rental agreements. If booking via HomeAway, they offer a “Booking with Confidence” policy to its tenants which would have provided assistance to Mrs.Karlsson’s and family in this case of evacuation. HomeAway provides a secondary insurance policy which could have been enacted by tenants in a state of emergency and/or displacement. To the Karlsson’s, I again apologize for the 2-days you were out of power, 9 days without TV during your stay with us. I hope the remaining 3+ weeks in Cocoa Beach were enjoyable. Cocoa Beach offers a variety of activities which includes Water Sports, Kayaking, Fishing, Art, Shopping, Great Seafood and Dining, Live Music, Golfing, and of course just lying on the Beach and enjoying the view and the breeze. Please email me for a list of a list of Top Things to Do in Cocoa Beach. This includes some of our favorites to help you plan a great vacation!! We have a minimum 2 week rental in our community. Those travelers only interested in a one week vacation, please email me. We will provide competitive pricing for a weekly rental, however will be required to execute the lease for two weeks. Two weeks: $499.00-1099.00* Month: $999.00-1899.00 These prices include tax. The fluctuation in rates is based on the season. It's time to start planning that summer/spring vacation. We have great weekly rates as low as $599.00 for the one week and if you'd like to add the second week, we will do so for only $300.00. I always keep our calendar up to date.